Captain Cliff Campbell of the Vallejo Fire Department, left, and Vacaville Fire-fighter Matt Moreno, unveil “Christine” while Suisun Fire Chief Michael O’Brien watches from the podium. 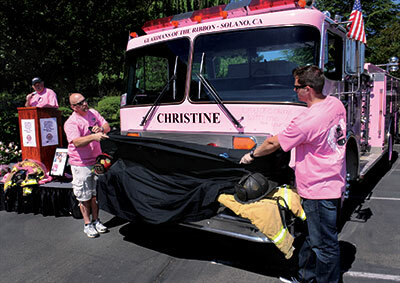 Christine Franklin’s memory lives on, her name emblazoned across the front of the Solano Chapter of the Guardians of the Ribbon/Pink Heals’ first pink fire engine. 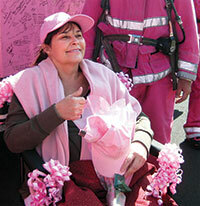 Just days before her death in June 2011, NorthBay Guild volunteer Christine Franklin was honored by a visit from a pink fire engine, and a number of burly firefighters clad in pink, bearing pink roses. Today, her memory lives on, her name emblazoned across the front of the Solano Chapter of the Guardians of the Ribbon/Pink Heals’ first pink fire engine. The truck was dedicated in her honor at a very pink ceremony May 23 at NorthBay VacaValley Hospital, and her family, friends and community members were on hand to witness it, and sign the truck themselves. NorthBay Healthcare Foundation Board Chairman Jim Lawrenz sits in a crowd of pink during the dedication ceremony. The first signature, however, came weeks earlier, when the pink delegation made a special trip to Nevada City to visit Christine’s sister Tracey, also dying of cancer. She had entered hospice, but the Solano Chapter very much wanted her to have a chance to sign the truck. And so, in very large print on the very front, it reads, “You are always with me OXOX your sister, Tracey.” She died in May. NorthBay partnered with the national chapter of the Guardians of the Ribbon in 2011 to display the trucks. Three of the chapter’s pink engines were featured in that year’s Fiesta Days parade, along with about 300 pink-clad employees. This year, NorthBay went pink again—but this time the featured engine was the Solano Chapter’s new truck, which originally belonged to the Vacaville Fire Department before it was donated to the local nonprofit. NorthBay pitched in by purchasing the decals that bear Christine’s name and the Solano’s chapter’s emblem.